This thread crochet friendship bracelet pattern came about from a desire to create a group gift for a cohort class of 14 people. This is a simple crochet pattern that works up really easily and quickly, making it a great choice for a group gift. It is a unisex crochet pattern so you could make them for co-ed groups as well as groups of just girls. Although we often think of friendship bracelets as something for kids, they can actually be a touching celebration of friendship at any age. People who don't wish to wear them as they are can use them as keychain charms or bookmarks instead. This crochet bracelet pattern takes just a few rows and a little bit of experience with thread crochet. This slideshow shows you the steps to create your own easy thread crochet friendship bracelets. You may need to make small adaptations to create the size and style of friendship bracelet that is right for your group. At the end of this slideshow, you'll also see how this pattern can be adapted to make a beautiful, unique crochet gift bow. You will find that this pattern serves as the basis for a very adaptable design; tweak it as you wish! The recommended size of crochet hook for this pattern is a small size 9mm thread crochet hook. However, this might be too small for some people to work with, especially since the project is crocheted with two threads held together. The recommended size is for best for people who already have experience working with smaller crochet hooks and tend to have a loose tension. Play around with hook sizes to see what works for you; the bracelet design is adaptable so just do what feels comfortable. Hold both strands of thread together. Crochet a chain. The recommended starting chain is 52 stitches long, which is the right size for the recommended hook and loose tension. This should make an adult-sized crochet friendship bracelet. You may need to adjust your own number of stitches to make the bracelet size that you want, especially if you have a different hook size or tighter tension. The length of the chain will be approximately the size of the entire bracelet so you can easily gauge how long to make it to suit your needs. Step two of this crochet pattern is really easy. 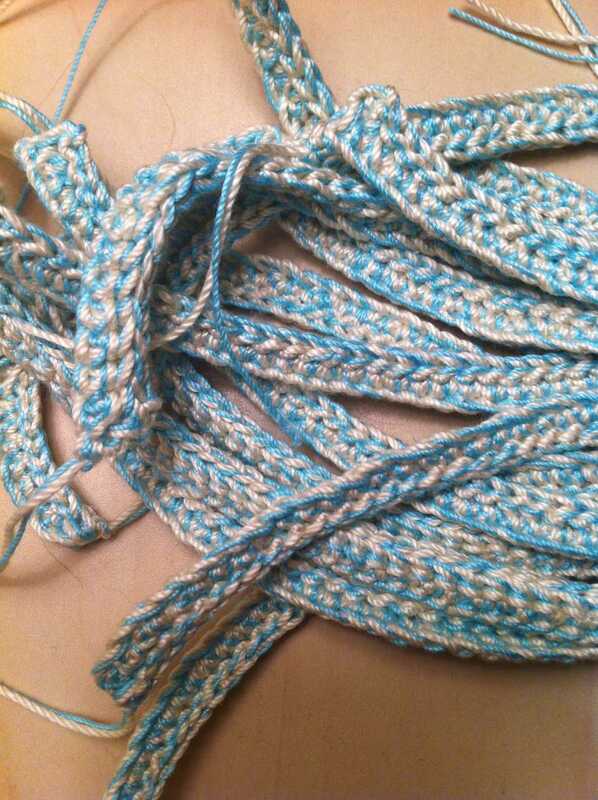 You simply turn the chain that you've already worked and stitch one hdc into each chain across the row. You are still working with both crochet threads held together. That's what creates the beautiful two-toned effect that sets this particular friendship bracelet pattern apart from others. This is the last row of the crochet thread friendship bracelet, which might be hard to believe since it seems like you just started but that's what makes it such a simple crochet pattern. Turn your crochet bracelet. Now slip stitch into the back loop only of each hdc stitch from the row below. Note that working the slip stitch into the first stitch of the row is optional; some people find it difficult to work that first stitch and it won't make a big difference to the design if you skip it. Leave about two-three inches of thread at the end of the crochet friendship bracelet. Cut and tie off. Do not weave in ends. The beginning and ending ends of the thread crochet bracelet will be used to tie the bracelet onto the arm of the recipient. This project was originally created to make fourteen of these thread crochet friendship bracelets for a group of people. It's a great way to connect a group of classmates, coworkers, family members or friends. When collecting all of the bracelets together to give to the group, they were bound together using a silver crochet hair tie. The result was an unexpectedly beautiful crochet bow that could definitely be used on a special gift. This is great if you have a special gift to give to a group, with the friendship bracelets used as a bow but gifted to each person after. You could also make the bow itself just because it is beautiful!